Recap: I’m going to go out on a limb here and say that Diane Keaton is one of the most iconic actresses of the last 50 years. She set the bar high in Annie Hall and The Godfather and has continued to make great movies in her later years, including The First Wives Club and Something’s Gotta Give. So when I decided to read her memoir, I couldn’t wait to read about her experiences in those films. As a reader, I got glimpses into those moments — like the smallest bit of acknowledgment she received from Marlon Brando and her relationships with Woody Allen, Warren Beatty and Al Pacino. But it wasn’t enough. 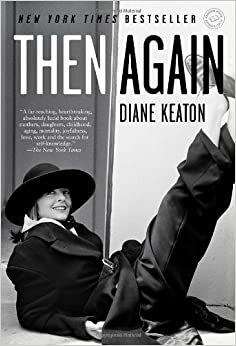 As the book went on, it became clear that writing this memoir must have been a cathartic experience for Keaton, who wrote a lot about the loss of her parents to cancer and Alzheimer’s and the adoption of her children at the age of 50. Don’t get me wrong; the way she writes about her family is beautiful and descriptive. (By the end I knew the names of all her siblings.) But it wasn’t what I expected or necessarily wanted to learn more about in the memoir. Analysis: Keaton’s nonchalance about her acting and career comes off as modest, which is mostly cute and refreshing, if not slightly self-depracating. While I can understand her disbelief over making it to where she is, it’s still hard for me to believe at this point that she doesn’t think she’s a great actress. Maybe if she had included more about her acting experiences, I would better understand how she feels about them and how she sees herself. That said, there is something to be said about the interesting format in which she chose to tell her story. She includes entries from her mother’s journal, letters written between her mother and herself, and letters she has begun to write to her own children. At times the format is confusing. It’s difficult to keep up with whose voice we’re reading from — hers or her mother’s. But as annoying as it is to hear so much from her mother’s point of view, it does help to further explore and explain Keaton’s upbringing and her relationship with her mother. Get Then Again in paperback for $13.51. As if the last year wasn’t busy enough for Academy Award-winning actress Reese Witherspoon (Wild, Gone Girl), she’s taking on another big…well…undertaking. Go Set a Watchman is due to be released in print and audiobook on July 14th.